So I think every child, after watching Bambi, wants to own one of the forest creatures. For many years after seeing Bambi, my daughter wanted Flower. And yes... I did! I understand everyone may think I'm crazy. 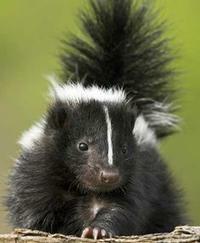 However, I co-owned other skunks and other unusual pets the four years at my agriculture high school. "They're ready," my friend Rose told me over the phone. "How soon can you come pick one out?" she asked. "As soon as I can find a ride," I replied. Hanging up the phone, I finally found my ride for the weekend. Away for the weekend, my daughter was going to be completely surprised when she came home. My friends and I began our journey early that Saturday morning. A beautiful spring day, so scenic. The day was sunny, clear, with a warm fresh breeze. As we got closer to our destination, the landscape changed. Lots of tree farms, cattle, horses, even sheep with a few scatterings of goats in between. Brad, our driver, announced two-and-a-half hours later, as we started exiting the turnpike, "We are almost there." I loved the lush fields we were driving through. Various trees lined the dirt and gravel road we traveled on. "I would love to own a place like this," I said to Dougie, who came with me. He's also a family member who loves animals. "Yea, especially no close neighbors!" "Look," I pointed, is that what I think it is?" "Wow!" Brad said, then Dougie exclaimed, "A lion!" As we got closer to the now-visible house, we could see kennels. Some were filled with different breeds of dogs. Then, turning into the driveway, we saw several kennels of exotic cats. This was wonderful for us. We knew where to look first. "Hello" and "Wow," we greeted our host. "This is awesome! I could stay here forever!" They laughed as we moved toward one of the kennels. "Until you have to do the work to keep this place running. Getting up at five a.m. everyday is not easy, especially holidays." I turned to his wife: "Hi, I'm Linda; this is Dougie and Brad." Hugs with Elliott, Rose, and me. Handshakes among the others. "Now," Rose smiled, "let's get your baby." And that's how Flower came into our lives. I watched the tiny eight-week-old chocolate cream skunk checking for ways out of the cat carrier. Milk chocolate and a cream stripe with hazel green eyes, over a pink bubble gum nose, stared intently at me. She was adorable. I couldn't wait to get home to my daughter. "Hey Mom, I'm home," I heard Nessa making her way in. "I'm in the kitchen," I yelled. "How was your weekend?" "How were your grand puppies?" she responded. We laughed. Keno and Marsha are her and my son's dogs, who I puppy-sat when she went away. My son was away at school in Ohio. Aside from complaining about the TV programs, they were fine. Keno, Nessa's dog, watched TV. "Did you notice anything new?" Nessa looked around. Our various animals were laying around. "Nooo, where's Zero?" Nessa's thug cat has a black mask across his face... thus the name Zero. "Outside, probably at Wayne's." Our neighbors have had a cat colony since retiring from the library. "Okaay." "Go to the door and look around," I suggested. A brief moment of silence, then, "Noooo! You didn't. Why? How? Oh, my god! You're beautiful! Are you a boy or a girl?" Nessa laughed. "You're a feisty lil girl, aren't you!" And with that, Flower became family. Once Flower had her shots and became big enough to hold her own, and more importantly find the litter box on her own, she was free in the house. We were so used to her presence that it was entertaining to watch other people notice her. It went like this: People came in. They loved our parrot baby, pet dogs, and cat, or not. We could tell when Flower came out: "What the heck is that—a possum? What is it? Oh Lord, does it bite?" They lifted their feet onto whatever furniture they were sitting on. So the procession was like this: a dog, then the other dog, at some point Zero, and last Flower, who did like the others and checked out who everyone was, sniffing to see if there were any treats involved. She'd then amble away to lay on a dog as her pillow or wrap herself in her tail then go to sleep. Flower led a very interesting life. As a part of the Children's Program, with a permit, she traveled to different schools and programs to teach and help youth learn how valuable wildlife is. What surprised the children, and most of all the adults, was how soft, clean, and beautiful skunks really are. Flower's most memorable moments... breaking out of the lower part of my daughter's back door when she moved. For four months, my daughter's neighborhood buzzed about the this large brown possum boldly walking past them. I prayed we would find her before she got hurt, as she was descented. I finally caught Flower at twelve midnight in early fall. This night, after driving Dougie to work, I parked behind Moss Rehab Hospital. Leaving my lights on, I waited. Fifteen minutes later I saw a distinctive wobble cross in front of my car. I leaped out calling her name. She ran. Well thank God it was a skunk run, otherwise I would never have caught her. She had made a den under the hollyberry bush by the cul-de-sac driveway. Thank God for that busy tail I caught her by. Feisty Flower lived until she was 10 years old. We will never forget Flower. One would think taking in unusual animals would be dangerous or expensive, but as in the work above the challenge is worth the time and effort. Thank you Linda for sharing and showing that our hearts are able to embrace life in many of its forms.